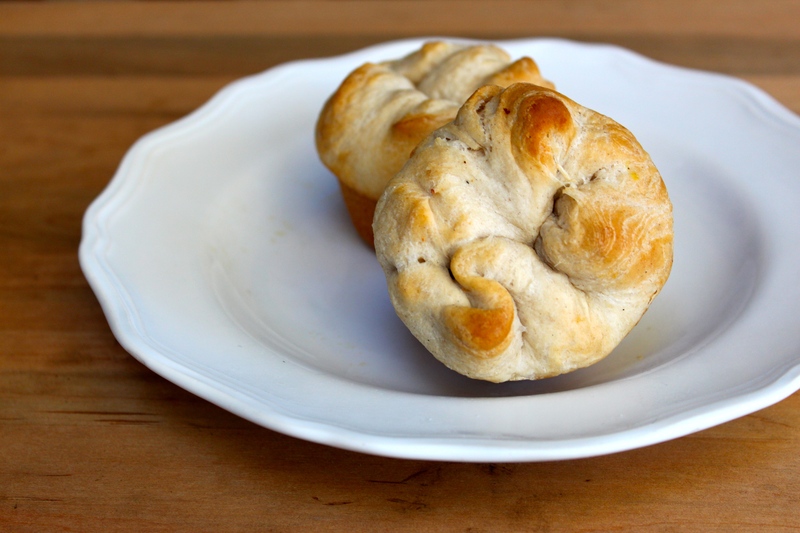 Happiness Project #45: Turkey Pie Croissant Buns! Another lovely Thanksgiving has come and gone but the leftovers? Still crowding up my fridge. And yours too, I presume. And since I’m always attempting to reinvent the same dinner dishes, over & over again, to appease my sassy & VERY opinionated 21mo Daughter, I spied a lovely looking Chicken Pot Pie dish on Pinterest a few nights ago and flipped it to create a Turkey Pie (of sorts) instead. Bam! Taking care of my fridge full of Thanksgiving leftovers, all the while creating a simple, yet Toddler friendly dinner dish for my Daughter, as well! Don’t you love it when inspiration takes care of two things at once? I do! Hence my happy kitchen Mama dance! Which involves much jumping up and down, like a kangaroo, with my arms flailing around & all over the place. And maybe a giggle or two. Just because. *Please note that all of the ingredients listed above, are leftovers from my family’s Thanksgiving dinner. You can substitute with ANY of your own leftovers instead. Didn’t have Turkey? Use Ham instead. No mashed potatoes? Stuffing works just as well. More vegetables, you say? How about peas or carrots? Experiment and have FUN with it! Preheat the oven to 350F. Lightly butter or spray a 12 tin cupcake pan. Pop open the Croissant can and lay out each of the 8 jumbo sized biscuits onto a marble or wooden work surface. Using the flat of your hand, gently press out each croissant round until each round is nearly double in size. Lay each round into each cupcake tin, gently pressing and working the dough up the bottom and the sides of each tin, until you’ve created a 1 inch overhang, flapped over each of the tin’s edges. Now the messy part! Separate each of your pie fillings. Using a tablespoon, scoop in the mashed potatoes, followed by half a tablespoon of corn, and ending with 3 or 4 squares of turkey. OR create your own combination with your own leftovers! That’s the beauty of this recipe. You can create your very OWN Thanksgiving Pie! Brilliant, right? Once you’ve added in all of your fillings, flip up the overhang flaps of dough and firmly crimp (or press) together in the center of the croissant dough. Essentially, creating a messy looking bun. The key word being: messy, my friends. Messy. Pop the cupcake pan into the oven and let bake for 12-15 minutes, until the tops are a lovely golden brown. Remove from the oven and let cool for a few minutes before turning the buns out of the pan and then serving. So, SO easy! And the perfect way to use up all of those yummy Thanksgiving leftovers!